About a year ago I wrote a blog post around screen shots I took from my iPad. 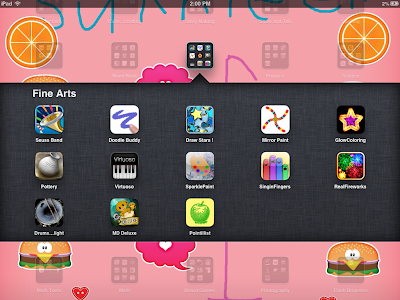 There I talked about some of the apps that we were using in my grade one class to learn, show, and share our learning. I also tried to link out to class blog posts or student blog posts to illustrate exactly what I was referring to. This year my students had a lot more choice in how they learned, often making their own decisions on what tools they wanted to use. Because my students have so much choice I figured I'd share some screen shots again and talk about some of the ways they've been using their iPads in class. I hope this is helpful for others. 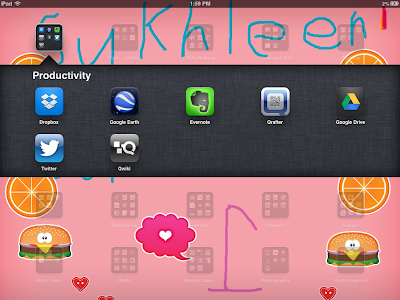 Productivity apps found on my students' iPads. Double click any image to see them more clearly. Dropbox has once again been a great way to share things between iPads such as photos or co-created books. When we made our group book for our We Can See project it was the easiest way to collect all the individual photos off of the iPads. We also used dropbox when we worked with Mrs. van Rees' class when we created our own version of Good New Bad News Stories. In addition we used it when we co-created books with high school students. It really was an invaluable tool for my students since we don't have e-mail on our class iPads. 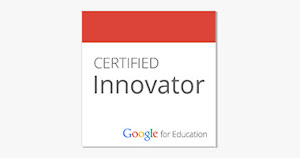 Qrafter was another valuable tool that my students used regularly. Whenever we had shared photos of images from say, a field trip, that my students needed to access, I would create a QR code so that they could access them from their iPads via Qrafter. 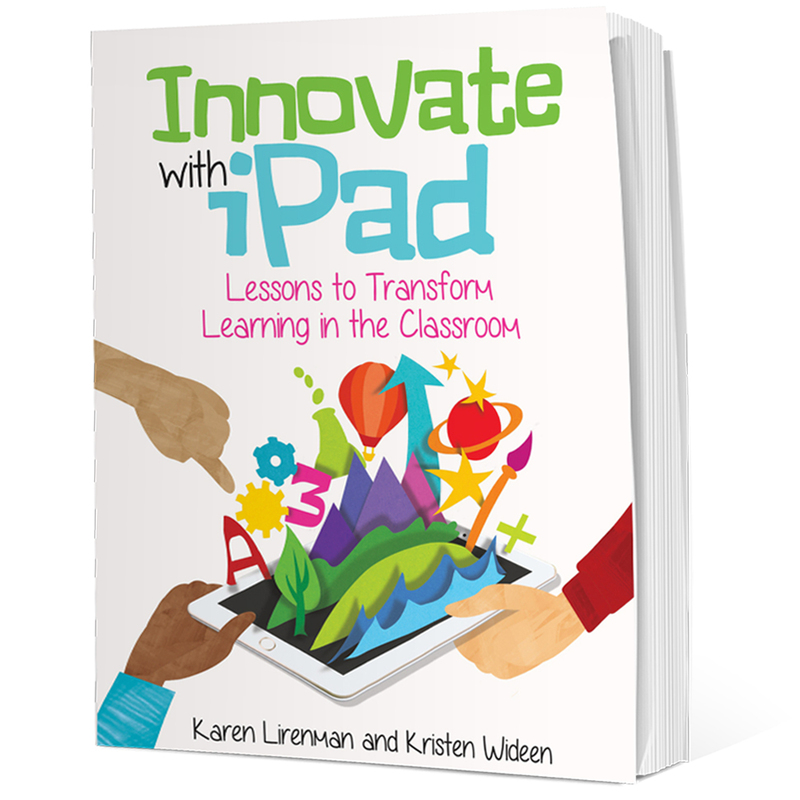 From there they could download them to their own iPads and use them in their blog posts. We also used Qrafter to access Today's Meet rooms which we used to collaborate with other students. We used Qrafter to access our padlets too for collaborative or whole class brainstorming and idea sharing. Twitter is the third app in this folder that we used a lot. Each iPad has our class twitter account logged into it. It was used as a choice for reading, or to learn or share learning with the world. 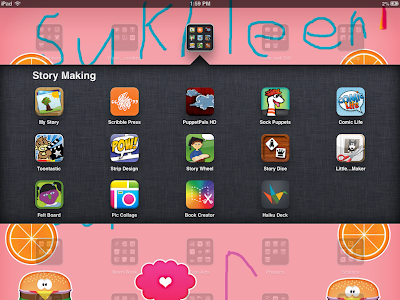 Story making is another set of popular apps that we used but each year different apps are popular with different classes. 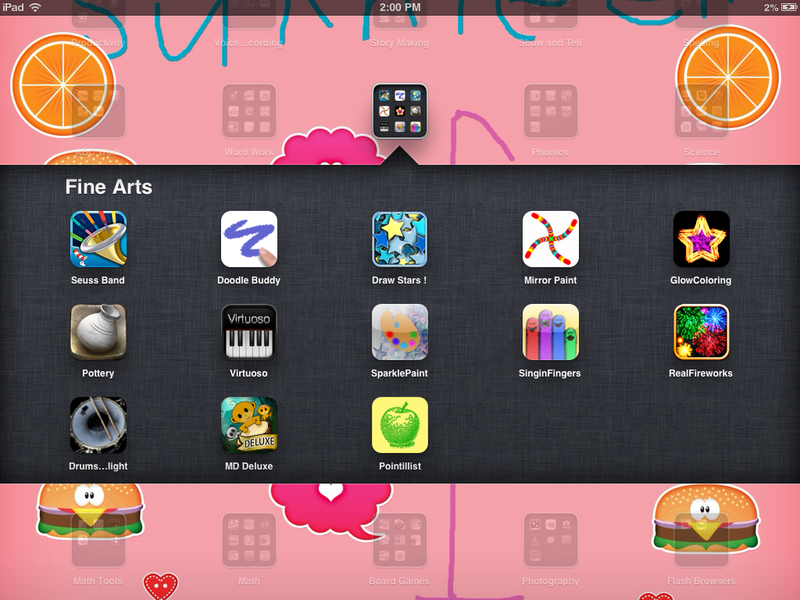 This year my class used five apps in this folder more often then the others. In no particular order they were as follows. 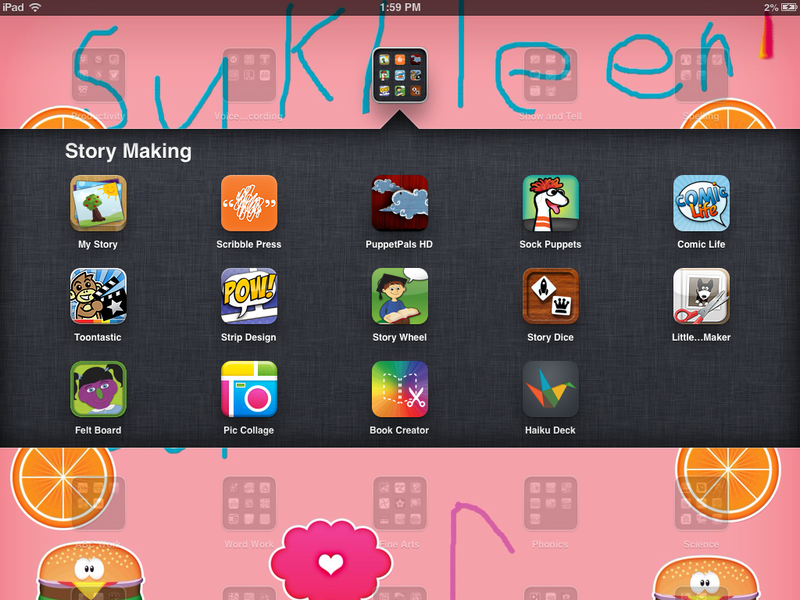 My Story - many students loved this app because they could draw, write, and record their stories. To share the stories on their blogs the students took screen shots, then imported those screen shots into an app that recorded voice, then put those into iMovie to created mini book movies. They did this for many of the books that they made. Comic Life - this was a popular app particularly with the boys during their "Pokemon" adventures. Several of my boys wanted to create comics with their pokemon cards so this was the perfect app for them. Pic Collage - this was a great app for so many different reasons. It's a really easy to use picture collage creating app that allows you to add text. My students used it to create 2D 3D shape posters and to share living and non living things. We often used it to tweet several pictures at the same time to give a feel for what we were really up to. Book Creator - this app was used a ton this year particularly when we figured out that books could be created on different iPads, then through the use of dropbox, combined together. As mentioned above it was used when we co-created books with our high school buddies. It was also used during our animal research projects where different students worked on the came animal book and then used the features in Book Creator to combined books. I hope we can co-create more often with other children around the world. Haiku Deck - we started to use Haiku Deck right near the end of the year. It was so easy for my students to figure out and the created some really great "Canadian Symbols" decks. I can see them using this a whole lot more next year to write stories from their images or to share facts about animals. 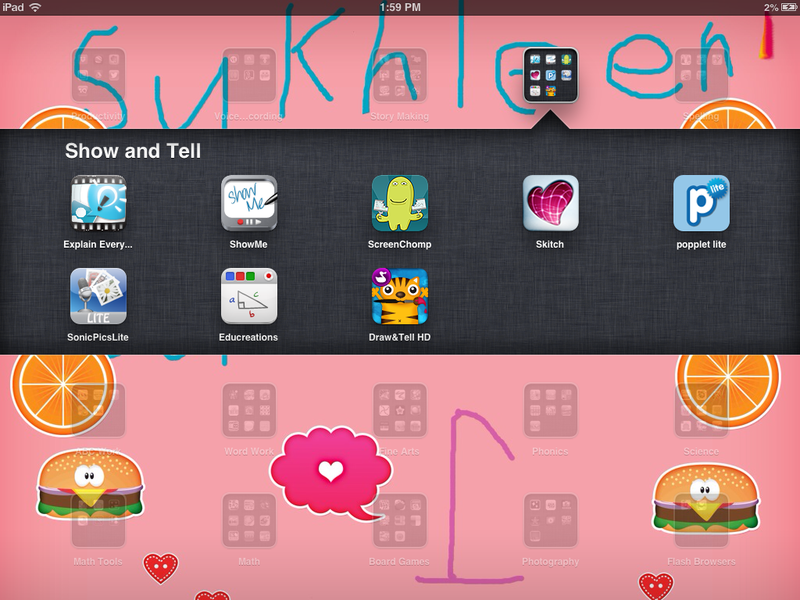 Show and Tell Apps are very popular apps in our classroom. My students use them all the time to show their learning and talk about what they are learning. Once again in no particular order here are some of their favourites with samples of how they used them. Skitch - Skitch is an app that allows you to annotate images. 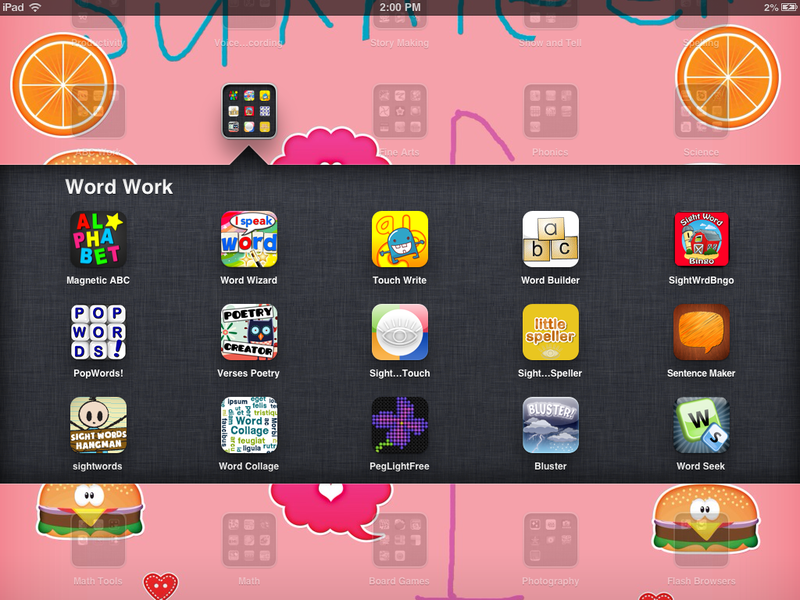 My students quite liked this app when they wanted to label their work - whether it be math, word work, or science. It was their go to app for basic image labelling. Popplet- This app allows you to create webs. The best part about the app is you web can include pictures that you draw right with in it, images that you up load from an iPad camera roll, or words. It was used to show comprehension, share facts about winter, and animals research. Educreations - This is a simple white board app similar to Screen Chomp, and Show Me. This app was most popular of the three because it provided my students with an embedding code which they quickly and independently add to their individual blogs. My students often used this app to show their mathematical thinking or word work. Explain Everything is also used in our class but I have to admit the drawing tools are not particularly enticing to my grade one students. The potential for this app is huge though as it does much of things that the other apps do but all in one app. My students used it when they created shapes around our classroom mini movies. Word work is done in so many different ways in my classroom. The key is that my students play with letters and words to create words. Each child seems to have a few favourite tools and the tools tend to change as the year progresses too. 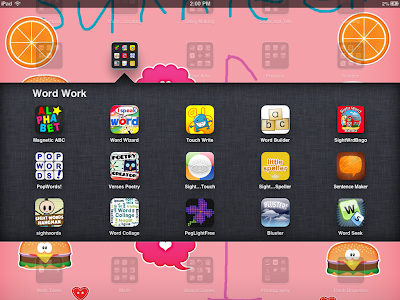 The three most popular word work apps in my classroom include Magnetic ABC (which is interesting since we have lot of real magnet letters), Word Wizard, and Touch Write. I think the draw to Magnetic ABC is that you can easily change the colours of the letters and there are some background options as well. Word Wizard is a fantastic app because it makes the letter sounds for each letter you chose and it blends letters together to read full words. Touch Write I think is just fun for my students. They are able to add their word wall words easily and love the tools for practicing them such as chocolate frosting or whipped cream. During word work time some of my students love to use Chicktionary and Rocket Speller to learn the spelling words of their choice. Chicktionary is all about creating words from the letters that are available. It interesting to see my student manipulate letters to create new words. The fine arts apps aren't used as often as perhaps I would like but then again my students learn with real instruments and art tools. 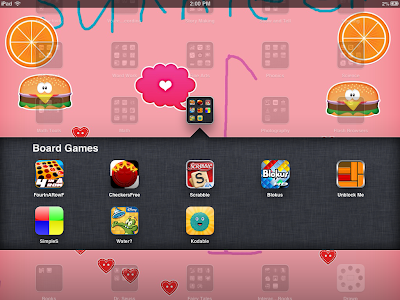 However Doodle Buddy and Draw Stars are two popular apps they use to create letters to play with words. Again while my students have several apps in the Science folder the most popular ones were Discovery Ed and Pocket Zoo HD. 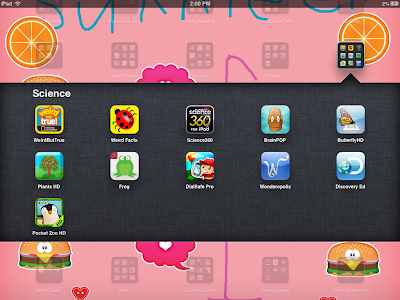 These apps were used for research over and over again when they were learning about animals. The other app that is in this folder that my students loved when I taught them about calling 911 in an emergency is Dial Safe Pro. This app is great to help students learn what will happen on the phone if they ever have to call. With headsets on my students listened and answered the questions the "dispatch" was asking them. If 911 safety is part of your curriculum I highly recommend this app. It's a great way for kids to feel comfortable about calling 911 and knowing what to expect when they do. 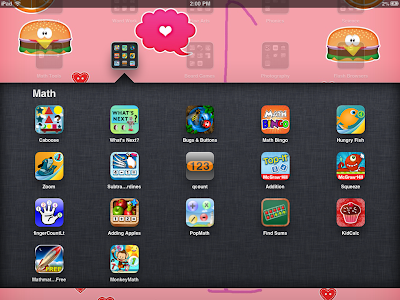 My students do have a folder of math games but I must admin after the early months in the school year my students rarely return to these apps for learning. Some of the favourites early on were Find Sums, Math Bingo, and Hungry Fish. If you're wondering how they did their math digitally, check back on the apps that I refer to as "Show and Tell" apps. These apps allowed my students to illustrate their number, pattern, and shape math knowledge in a far more personalize manner. While my students have some games on their iPads Where's My Water and Kodable were two favourites. Depending on the student some also liked to code with Cargo-Bot. 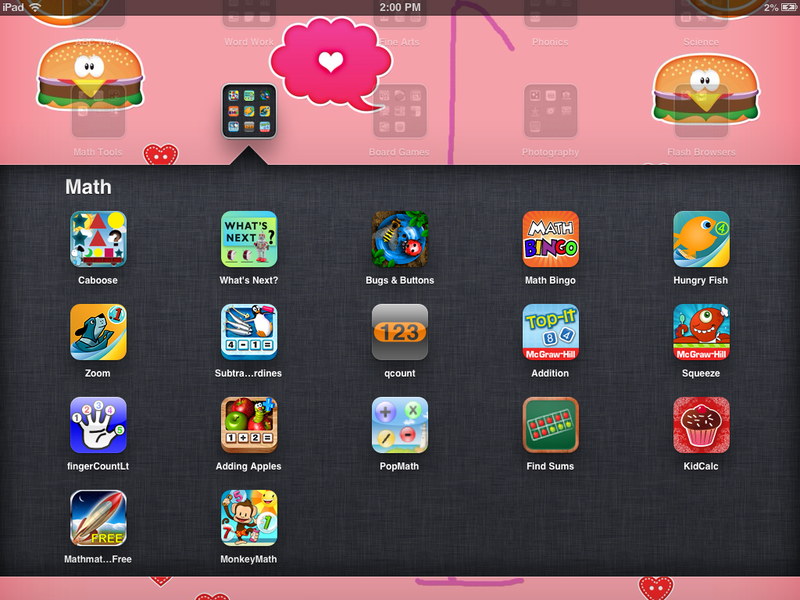 Hopscotch was downloaded on some iPad apps too, but it wasn't used much. Coding was pretty new to my students in the final term. 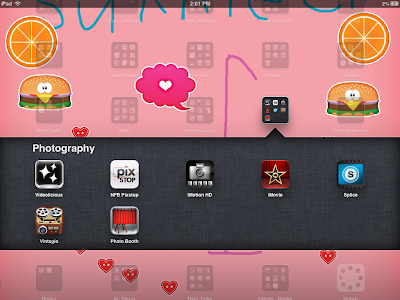 While there are several apps in this folder iMovie was by far the most popular app. My students made movies all the time as a way to show their learning. They created books, math videos, movies about Halloween costumes and so much more. It's super easy for the to use independently. They can record right in it and add music too. One thing that my students didn't really like was the Ken Burns effect which is automatic when you add images. They found that it often cut off their text. While they could fix is, they often choose to add their voice in Draw and Tell, then add those short videos to create their movies. They discovered that when you add movies vs images you don't have to deal with Ken Burns effects. Now how could I forget those important apps that sit on the shelf at the bottom of the iPad. The KidBlog app has been a total game changer in my class this year. My students use this app all the time to upload and share their learning with the world. The app is so easy for them to use and it has made their individual blogs and digital portfolios that much more rich. The camera and camera roll are also vital features for my students as they are key in helping them document and save their documentation. My students also have quick access with a direct link to our class blog, and to the internet with the Safari app. 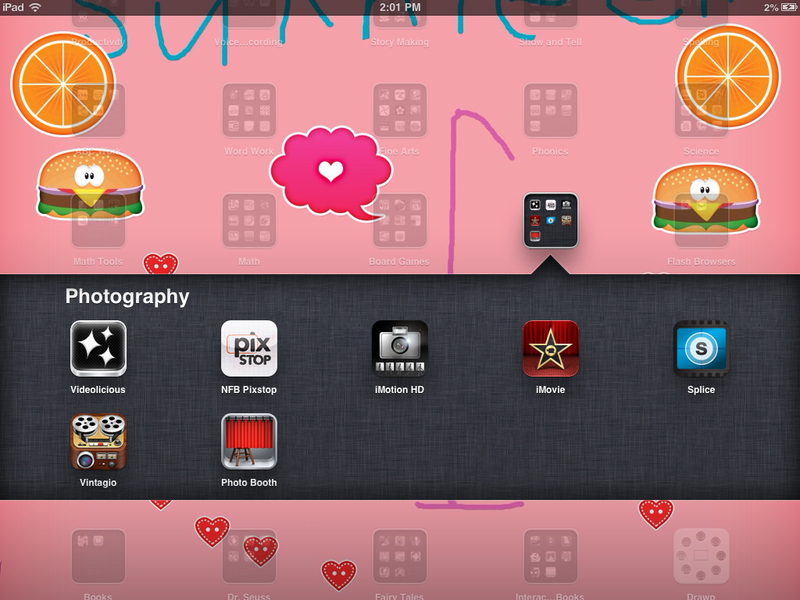 They use these five tools (KidBlog app, camera, direct link to class blog, photos, and Safari) all the time for learning. Thank you for the list and the input from your students. I had one question about DropBox. How did you handle the Dropbox account with your students? Great question Chrissy. Typically when my students have created something that needs to be shared through dropbox I put it into dropbox for them. Typically with preplanning I have already created a folder waiting for this work to be uploaded to it. This helps keep our dropbox organized. When I know they will need to access something from dropbox I go to on line in advance, sign in to the account, grab the link for the specific folder, and create a QR code. My students scan the QR code and then they take what they need from the dropbox folder. Does that help? Thank you so much for sharing this! I love all of the snapshots and videos you included of student work, really helps! Many many thanks for sharing for nice list. Your post really helpful. Thanks this is another good information about iPad. Thank you for sharing all of your great work and ideas! What kind of schedule do you follow? I have 6 iPads available. I am not sure what you mean by "schedule". Typically the morning is focussed on literacy, numeracy is between recess and lunch, and the afternoon is open for science/socials/art/physical education. I say "typically" but each day is so different. By schedule I am wondering how you structure the blocks of time for literacy, math etc. and how the iPads are integrated. For example during literacy time do you spend so many minutes on direct instruction and then have centers? Do all children work on iPads at the same time? How much time is allotted for iPads? I am looking to restructure how I do things so there are more choices. Thanks for your thoughts on this. After reading your article I guess, kids will really enjoy the studies through iPad.